"It's been far too long..."
Players: James, Soren, Jeroen, Jon, Michel, Gareth, Paul, Woody, Philip, Andy and Barrie. Towards the end though things started to get confortable for me as I'd completed several region bonus's and had the most wagons. All I needed was the Lotz-Pilsen route to come up for the 9 region bonus and once they did I was able to bring the game to a close by using all my route markers. The final scores weren't that close but Soren pipped Jeroen to a close 2nd place. Great game, and even taking into account time to teach a new player we had the thing done and dusted inside 50 minutes. Each time I play this I feel like it's a really good game, but it never seems to get the love it deserves which I can only put down to theme... seriously, change this to something flash and I think it'd launch the game to a new level. Anyone ? Thurn & Taxis was being played on another table, so there was time for another mid-length game – and San Juan fitted the bill perfectly. This contained the much-coveted expansion cards, which give a really nice twist on this already excellent classic. As well as diluting the deck slightly (making a production strategy slightly less powerful), it also provides several new ways to score points, without adding any complexity to the base game. The event cards weren’t used in this game. Jon saved up to put down an early Library, which quickly put him 2 buildings behind Michel, whose early goldmine turned out to be more of a tin mine. Gareth got some production buildings going quite early, and the later addition of the Harbour (put a card under it each time you make a trade) proved to be a nice little point-earner. In the mid-game, Michel played a Quarry, which helped him with his final few builds, whilst Jon laid down the Bank (put as many cards from your hand under it, once in the game, for 1 point each). Although it meant foregoing trading for a couple of turns, Jon eventually picked the trader role, and used his Library ability to trade 3 goods in a turn. Combined with his Market, this gave him 8 cards which were quickly deposited into the Bank. Gareth had saved up the 7 cards necessary to buy the Cathedral (score 4-3-2-1 for each other players’ 6-point buildings), but unfortunately he failed to score many points from it as only Jon had played a 6-point building. Michel built his final building to end the game, and when the final scores were counted, Jon had pulled away from the others, with his Guild Hall and Bank doing the most damage. This is definitely a game worthy of much more table time – especially with the new expansion cards. 5 players and an i-Pad timer make for a great Chinatown experience. With each trading phase limited to 5 minutes, it really focussed everyone’s minds, although the end of each period often left trades unfulfilled. For the first 2 rounds there was little building being done. In the third round, Jon and James were in strong negotiations to swap ownership of several lots in one district which would give James a nice 6-lot area, and Jon a 5-lot area. James was playing hardball, which gave Paul the opportunity to step in and sell Jon 2 of his own lots, giving him a 5-lot area and denying James anything worthwhile. The USP for this sale was “Not only do you get what you want, but you screw James over as well.” Paul knows which buttons to push…. Woody was going about his business in his usual understated fashion – moaning regularly at his lack of good lots or tiles, but eventually putting down some extremely lucrative businesses, and quietly doing some profitable trading. Soren had spent almost the entire game trying to a 6-lot area (he had the tiles quite early on), and eventually made a deal with Jon in the last round to get what he wanted. When the dust had settled (and James had stopped trying to negotiate trades outside of the negotiation phase) the money was totalled, and Woody’s quiet but steady accumulation of wealth had proved enough to have him crowned King of Chinatown. The purple company soon increased its value, and Paul was keen to progress Brown too, until Jon helpfully sabotaged it around Normandy. Woody took the Blue company south towards Marseilles, but it ceased expanding well before it reached such a southerly destination. The Black company failed to exit Paris, despite Paul picking up some late stocks in the vain hope that it would suddenly spring out towards the profitable eastern side. The trick of this game seems to be managing to pick up the maximum allowed stocks (12 in a 5-player game) but this is easier said than done, if you don’t want to end up with some duff stocks at the end. Jon had managed his stock acquisition the best of all the players, in what turned out to be a close game. Woody had exited, so the remaining 4 players chose an older game to finish off the evening – namely the eye-candy that is Carcassonne: the City. There are a couple more ways to score points in this version, as opposed to vanilla Carc, but with a first play, it’s not immediately obvious what to try to focus on. Having said that, it’s quite situational, so choices on each turn are fairly limited. There is an equivalent scoring to the base game’s ‘farmers’, which scored well for Paul, but also placing guards on the walls at judicious spots can lead to some healthy points. The game finished with the walls nearly enclosing the city soon into the third stack of tiles, and the final scores were incredibly close, with Soren and Jon sharing first place. re, while Andy was new to the whole concept, and- as luck would have it- going first. After a brief consultation he drew two more cards and developed his factories. I placed a cotton mill and railroad over in the North East, Barrie drew two cards and developed his factories, and Andy drew two cards and developed his factories. I placed a port and shipped, paying back my loan. I think Barrie now placed a cotton mill and railroad in the South West. Andy placed a Coal Mine in Belgium and a railroad to the Ruhr. I placed a steelworks in the Ruhr and developed my factories. Andy was able to build a factory in the Ruhr and sell to Belgium. I managed to build a factory in Hannover and sell to Holland, Barrie sold his cotton in France- twice I think. There now developed three networks of rails and industries. In the North-West Andy and I had a network based round the Ruhr. In the North-East Andy and I had another network based around Berlin- which reached as far south as Bohemia. In the South was Barrie's own little network stretching from France to Munich. Before the game began Barrie had been asking about walling a region of the board off from the other players and he was prety close to doing it, but of course the flaw with that plan is it only works against industry cards. I was able to drop a factory in Munich with a region card, spoiling Barrie's plans for the distant market in Austria. Not long after that the three networks became connected and we ran out of coal (on the board). Fortunately Andy swiftly overbuilt his own coal mines to replenish the supply. Barrie and Andy developed past their level 1 ports but I used mine- in the second case in conjunction with Andy. The Kiel distant market was no demand so there wasn't much building in Kiel or Hamburg for most of the game. Eventually Andy's level 3 mines were exhausted, and the coal display, and Barrie overbuilt my coal mine in Bohemia. A little later I overbuilt his in France so honours were even. I was able to build and flip all my factories while Barrie and Andy had a couple unbuilt. The game ended fairly swiftly after the deck ran out, with me passing in order to discard my last two cards and stop the others earning more points. End game scoring is a bit tedious with the railways, but eventual scores were Barrie 38 Andy 45 Me 51 (I think). Good game, I like the flow of it better than Brass I think. Can't wait to try out the other maps (Minnesota/Japan was bundled into my copy at purchase)! 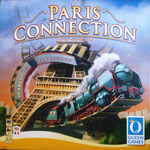 The other game to get an airing was Ticket To Ride: Nordic Countries, which Jeroen used as an escape route North from Paris, although it remains writeupless.